Vacuuming your floors usually isn’t a very fun task to do around the house, but it has to get done sooner or later. Since you have to vacuum anyway, you might as well buy a vacuum cleaner that looks good and is functional for what you need. The Euroflex Monster H055 Hi-Performance 2-in-1 Hand and Stick Vacuum with Accessories, 500-watt may fit both of those specifications. You may not have heard of the Euroflex brand before, but it is a high quality Italian brand that produces some sleek looking vacuums. The attention to detail that was put into this particular vacuum is phenomenal. 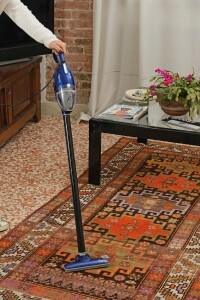 You owe it to yourself to see what the hype is all about regarding the Euroflex Monster Vacuum! This is the perfect little vacuum for those hard-to-reach places and areas that are just too inconvenient to clean with a standard upright vacuum. Since it combines as a stick and handheld vacuum, the suction is phenomenal on the Euroflex Monster H055 Hi-Performance 2-in-1 Hand and Stick Vacuum with Accessories, 500-watt. The included extension tubes are also convenient since you can reach higher areas or even use it as a stick vacuum. Storing this vacuum is easy because it is so small. The pictures may make it seem like it’s bigger than it is, but be aware that this is a small vacuum that is similar in size to a standard handheld vacuum. Overall, this vacuum does exactly what it’s supposed to do as long as it is used properly. Just because this is a multi-use vacuum doesn’t mean that it works on multiple surfaces. It is designed for use mainly on hard surfaces. It may work ok on rugs and other short carpet, but you’d be better off just using it on your hard surfaces. Many people have complained that the vacuum is essentially ineffective on carpeted areas. Other people have mentioned that it doesn’t do well with sucking up larger particles. For example, it struggles with picking up objects as large as kitty litter. While it is good for pet hair, you may want to find a different option if you are looking to clean up after your pets in other ways. The Euroflex Monster H055 Hi-Performance 2-in-1 Hand and Stick Vacuum with Accessories, 500-watt is a good option for you if you want a handheld vacuum with a little added power. Sometimes you need to have another vacuum cleaner option to complement your main upright vacuum, and that’s the category that this vacuum falls in. You can’t expect to use it for your everyday cleaning, but you can expect it to do a great job cleaning up crumbs around a table or in the kitchen, which is were messes usually occur. Since vacuums like this aren’t usually used very often around the house, it’s nice that it’s corded so you will never have to worry about a battery not being charged. Euroflex is a company that takes pride in their innovative products, which range from vacuum cleaners to steam cleaners and even ironing products. They are a fairly new company, but have ridden their innovative styles to become a top manufacturer of steam appliances. The company is headquartered in Italy, but they also have distribution companies that span around the globe. Not only are their products some of the most effective in their respective markets, but they also have a stylish appearance that make them attractive. Household chores can be daunting, but Euroflex tries to make the tasks as easy as possible for consumers.